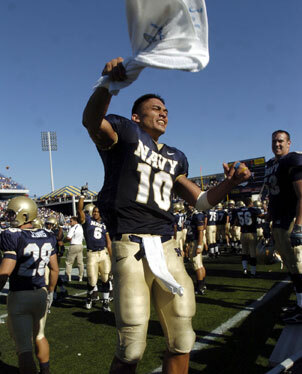 Kapolei alum Kaipo-Noa Kaheaku-Enhada ran 78 yards for the final touchdown in Navy's win over Air Force. ANNAPOLIS, Md. » Playing before a record crowd and with Navy's four-year hold on the Commander-in-Chief's trophy on the line, quarterback Kaipo-Noa Kaheaku-Enhada stepped up with two fourth-quarter touchdown runs, leading the Midshipmen to a 31-20 win over Air Force yesterday. Thanks to Kaheaku-Enhada's runs of 2 and 78 yards, Navy has a leg up in the quest for the trophy, which goes to the winner of the three-school round-robin featuring Navy, Air Force and Army. 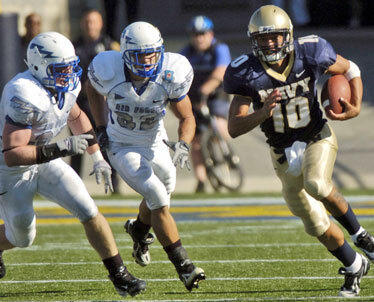 The Midshipmen (3-2) have won 10 straight games over their fellow service academies. "We said this was the first step in reaching the Commander-in-Chief's Trophy," said Kaheaku-Enhada. The Kapolei graduate ran for 101 yards. Air Force quarterback Shaun Carney had a record day in defeat, gaining 300 total yards to become the program's all-time leader with 6,780 yards from scrimmage. Carney also threw for a career-best 237 yards. Kaipo-Noa Kaheaku-Enhada celebrated on the sidelines once the game was done. Trailing 20-17 early in the fourth quarter, Navy drove 73 yards for the go-ahead touchdown. Kaheaku-Enhada hit O.J. Washington for 53 yards to the Air Force 20. Eric Kettani converted a fourth down at the 11, and then Kaheaku-Enhada scored on fourth down from the 2, giving Navy the lead with 13:01 to play. After an Air Force punt, Kaheaku-Enhada broke loose for 78 yards to put the Midshipmen up 31-20 with 9:18 left. The runs turned the tide in a game that saw the teams trade the lead through the first three quarters. "I am excited for our players. They did a tremendous job. They really hustled out there," said Navy coach Paul Johnson, a former Hawaii offensive coordinator. "Playing for the trophy is really important to us -- it's one of our goals." A win over Army on Dec. 1 would give Navy the trophy. WEST POINT, N.Y. » Corey Anderson returned the opening kickoff 88 yards for a touchdown and Jeremy Trimble scored on a pair of long touchdown plays to lead the Black Knights (2-3) over the winless Owls (0-5). Trimble got the Black Knights off to a big start, and then Trimble took over, catching a 69-yard touchdown pass from Carson Williams and returning a punt 85 yards for a score. Trimble finished with five catches for 125 yards and three punt returns for 128 yards. Army's Jordan Murray also scored when he recovered a fumble and fell into the end zone after teammate Caleb Campbell hit Temple's Jason Harper and popped the ball loose with his helmet at the Temple 24 with 8:46 remaining in the second quarter.